Red-brown to brown. Undersides being more pale. Short mane. Rainforest best of Central and Western Africa. Prefer savannas interspersed with patches of forest, reeds, or scrub. Few estimates available. One rough estimate of 56,000 (2018), but unknown how many live in Central Africa. Can run for bursts of speed (e.g., to outrun lions), but are not endurance runners. Not well understood for forest buffalo. Herds of small groups; some fluidity in group membership. Gregarious. Non-territorial. Lions, spotted hyenas, lions, humans. Not reported for this subspecies. 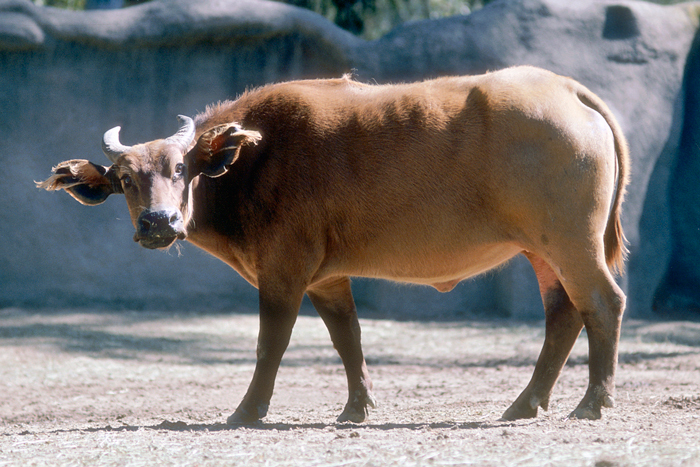 Perhaps similar to other African buffalo subspecies. © 1999-2019 San Diego Zoo Global. Minor updates 2017. IUCN Status and population estimates updated Apr 2019.